Stone has stepped into another realm with this philosophically inspired line of creative and interesting brews. One may want to consider having this poured by someone else while s/he blindly smells and sips and then sees the brew in the glass. The golden/amber hue definitely makes me think I’m in for a totally different aroma and taste, but then I smell coffee and taste chocolate with a hint of coffee at the velvety finish. In the new realm of coffee IPAs and golden stouts, our favorite brewers are certainly keeping us on our toes and welcoming the unexpected! 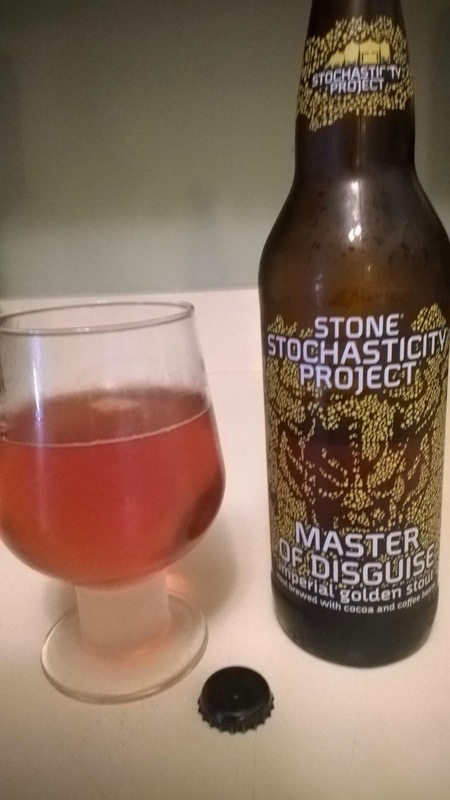 I love the “master of disguise” that is this brew, a golden stout, a gleaming gem I tell you. Love it! This entry was posted on December 7, 2014 by wineoh!006 in Uncategorized.